The M5 takes the BMW M-series into new territory, with 441 kW/600 hp, peak torque of 750 Nm (553 lb-ft) and 10.5 l/100 km [26.9 mpg imp] fuel consumption combined/ 241 g/km CO2 emissions combined, which promise supreme propulsive power and formidable performance. 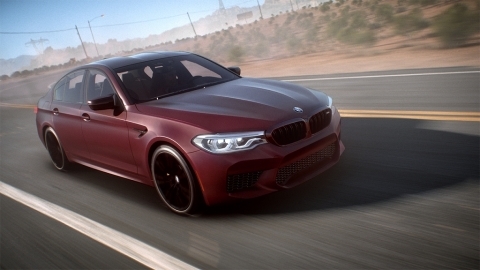 The new M xDrive developed by BMW M GmbH is the most engaging all-wheel-drive system yet to grace the high-performance segment and will be on display across various terrains in Need for Speed Payback. Need for Speed, one of the world’s bestselling video game franchises, returns with a vengeance in Need for Speed Payback. Drive as three distinct characters united by a common goal: revenge at any cost. Craft unique rides with deeper performance and visual customization than ever before. Get on a roll and win big with risk-versus-reward gameplay. The return of intense cop chases also means the stakes have never been higher. From insane heist missions to devastating car battles to jaw dropping set pieces, Need for Speed Payback delivers an edge-of-your-seat, action-driving fantasy. Need for Speed Payback will be available worldwide on November 10th for Xbox One, PlayStation®4, and Origin™ for PC. Need for Speed Payback Deluxe Edition owners will get their three-day early access starting Tuesday, November 7th. Players can also get into the action before launch through EA Access and Origin Access, where members can play for up to 10 hours starting Thursday, November 2nd with the EA Access and Origin Access Play First Trial.